Let's Have Fun With 'Mak Mak' At Macao! Let’s Have Fun With ‘Mak Mak’ At Macao! Home / News & Events / Let’s Have Fun With ‘Mak Mak’ At Macao! 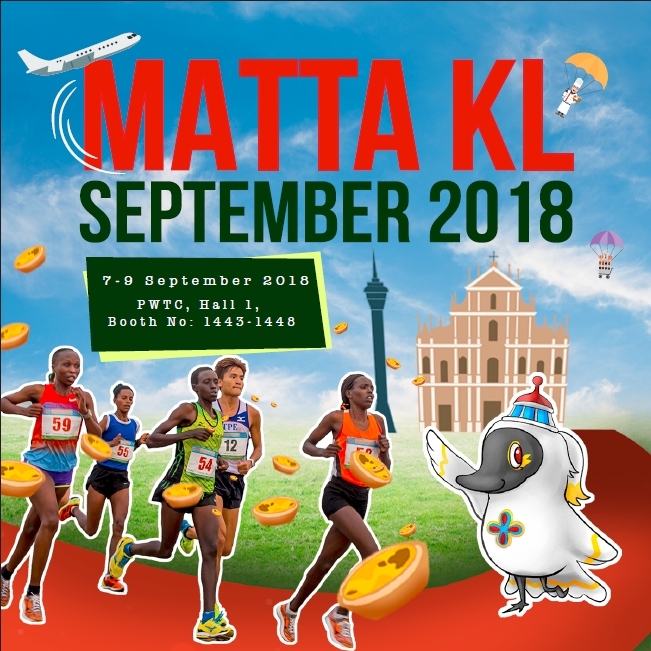 Kuala Lumpur, 4 September 2018 – Want to have fun in Macao? Then come visit the Macao Government Tourism Office (MGTO) at the MATTA Travel Fair this 7 to 9 September 2018 at the Putra World Trade Centre (PWTC) in Kuala Lumpur! The MGTO will be at Booth 1443 to 1448, Hall 1. Come on over and let 'Mak Mak' introduce you to the wonders of the culturally vibrant and gastronomically exciting Macao! Don't know who 'Mak Mak' is? 'Mak Mak is Macao’s official tourism mascot! It is a black-faced hornbill whose meaningful design is inspired by the Guia Lighthouse, representing Macao’s European influence. As a pathfinder, ‘Mak Mak’ shoulders the responsibility of guiding travellers to explore Macao – a city prized for its unique blend of Chinese and European cultures. Therefore, come follow ‘Mak Mak’ and visit Macao – you will definitely see its charm for yourself! In addition, there will also be a fun “Catch the Egg Tart” game held at the fair to add to the excitement! All you have to do is catch as many virtual egg tarts as you can within the stipulated time and you can win exclusive souvenirs! That’s not all! Another exciting game is the “Ready, Set, Go!” game where visitors can participate in a virtual marathon run through beautiful landscapes and landmarks of Macao! For the shutterbugs and “selfie queens”, remember to also come over to the MGTO’s booth and take Insta-worthy photos with the various backdrops of past Macao festivals! Delicious Macao snacks and cuisine are a plenty, but the Portuguese tarts and almond cookies are two of the most famous snacks that we all know and love. What charm do they hold that makes both tourists and locals alike enjoy them? To answer this mystery, the MGTO has specially prepared these two snacks for you to try – so come on over to the MATTA Fair and taste them for yourself! Macao is a vibrantly exhilarating city that never sleeps! Throughout the rest of the year, various exciting activities are lined up every month for the entertainment of tourists and locals alike! These include the 29th Macao International Fireworks Display Contest on 1, 8, 15, 24 September and 1 October, World Tourism Day on 27 September, the 32nd Macao International Music Festival from 28 September to 28 October, the 21st Lusofonia Festival from 19 to 21 October, the 18th Macao Food Festival from 9 to 25 November, the 65th Macao Grand Prix from 15 to 18 November, the Macao International Marathon on 2 December, the Macao Light Festival from 2 to 31 December, the Macao International Parade on 16 December, the 3rd International Film Festival & Awards Macao from 8 to 14 December, the Macao Shopping Festival 2018 and many more! Don’t miss the chance to experience the endless excitement that Macao offers – come now to explore and enjoy! For more event details, visit Macao Tourism Malaysia’s Facebook page at https://www.facebook.com/MacaoTourismMalaysia/.